Johnny Jordan, Fashion and portrait photographer from Ireland, working on both analog and digital format. International Women’s Day, and the strong message of empowerment and hope for equality that it represents, has become a day to celebrate the achievements of women around the world. Far too often in the field of photography, however, women are not the ones behind the camera. Amid the lush, subtropical environs of Brisbane, creativity and community thrive. Despite being somewhat hidden from the rest of Australia by the overhanging foliage, Deena Lynch has been growing and pollinating in the collaborative ecosystem of Brisbane. Hailing from that perennial wellspring that is the Fremantle rock scene, psych rockers Pond returned to Sydney to a packed out midweek crowd at the Metro Theatre. Since 2009 the band has undergone a morphing line-up and released eight albums, many to critical acclaim, and has performed as part of curated line-ups at festivals such as South by South West. I always carry around my Contax T2 when I'm travelling and love to shoot quiet and dreamy moments in busy cities. It always makes me fall in love with the cities a little bit more. This is a roll from when I was shooting a fashion campaign in Korea. Translating the metaphysical world of sport into a singular image could seem like an impossible task, but it is one that Australian photographer Delly Carr has been doing for thirty years. Between his global assignments and work as a Nikon ambassador, the multi-award winning photographer got a chance to sit down and tap out a few answers to questions we had and muse on the nature of his profession. 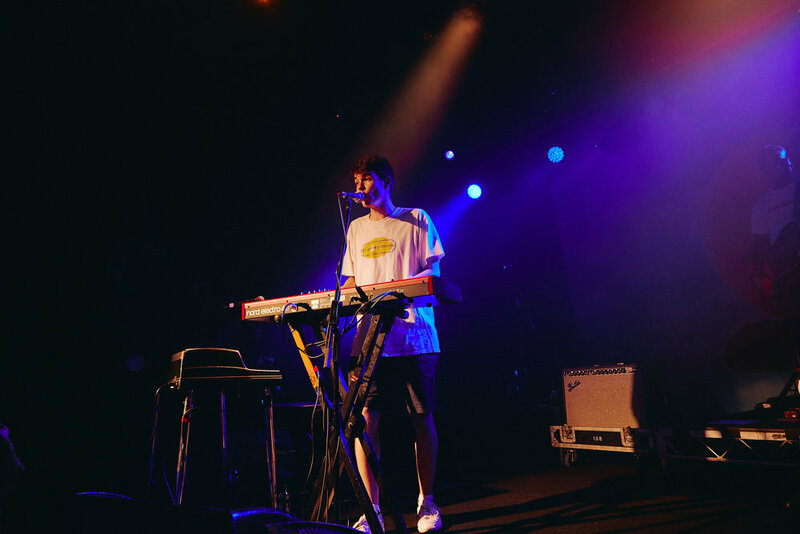 It's hard not to feel the love at a Rex Orange County show when the biggest hit by the British singer-songwriter is literally titled: Loving Is Easy. With warm lights that flashed on a crowd filled with young and old lovers, their arms cradled around each other, dancing and singing every lyric back to the band. Capturing the length of summer requires more than just a measuring of time. As it continues, the season seems into your mood, personality and body. The heat does not relent when the sun starts to dip below the horizon and suffuses the landscape. Evening and day seem to meld into one as the tips of golden light melt all that they touch. Photographer James Simpson caught WA surf rock/dream pop duo Mosquito Coast sampling all the sweet delights on the rooftop of Harpoon Harry. With their latest single Sweet Talking released last year and an album not far off, Naomi Robinson and Conor Barton are justified in enjoying the fruits of their labour. For the second year running, Aperture Australia will introduce audiences to the breadth of the photographic industry. Taking place at the Sydney International Convention Centre over the weekend of June 22-23, speakers and events will cover landscape, documentary, wildlife and artistic forms of photography. Having continually expanded over the past ten years, Head On Photo Festival is celebrating its largest program yet for this year’s iteration. Taking place for two weeks in May, the program currently includes photographic icons such as fashion photographer Helmut Newton and Masayoshi Sukita, who created some of the most iconic portraits of David Bowie. In the 2017 film Kodachrome, which followed a dying father and his son as they drove to Dwanye’s Photo, the last place that still developed the iconic Kodachrome film, the father Ben says, “People are taking more pictures now than ever before, billions of them, but there are no slides, no prints. I decided to adventure into the world of film after admiring the work of my friends Liv and Jake, and thought that a good time to start would be my two month trip to North America. I loved photographing the beautiful natural scenery and cityscapes, and tried to work on the framing of my photos to capture what it was like to be there! I'm still learning - particularly not to shoot with a super-basic point and shoot in low light - but I'm loving it anyway. Capturing the spirit of the South Coast is the waves that roll in on the shore, the markets in the park and the houses that fill up every summer. A moment lasts a month as the daily rhythms unfold and our routines become a ritual. It is an escape but also a return.